How do you wake up at 5am? Yesterday I wrote a blog post on why I enjoy waking up at 5am, and what I do when I wake up early. Today I am going to write about HOW to make it happen – it’s easy to say that you want to wake up early – but how do you actually force yourself to get out of a warm cozy bed…especially in the fall/winter when it is cold and dark? I cannot force myself to go to bed early. I really just cannot. I can’t make myself go to bed early just so I can wake up the next morning at 5. When I did my five day 5 am challenge, before the first day I just went to bed at my usual time (around midnight). And I set up alarm for 5am and just got up. I knew I would be tired by the end of the day, but that was good thing! I literally could not keep my eyes open past 10pm the first day. And that made getting up the next day that much easier! The second day I was asleep by 9pm – which to me is perfect as it gives me 8 hours of sleep. So – don’t force yourself to go to sleep early. Instead – force yourself to wake up early for the first few days, and you will then automatically start going to bed early. For me – this is KEY! I posted on Facebook that I was doing a 5 day 5am challenge and was looking for some friends to support me. A few responded, I got their cell phone numbers, and now I send out a text to them at 5:30am every morning and we tell each other what workout we will be doing. I feel accountable to them – and I will not let them down! It is much easier to talk myself out of an early wakeup if no one is counting on me. But when my friends are counting on me – I get up and I get to it! If you need an accoutability partner – that is what I am here for! Add me as a friend on Facebook at http://www.facebook.com/sheryjesin and we can exchange numbers – I would love to add you to our accountability group. Get ready the night before! I know I will be working out first thing when I wake up, so I get ready for that. For me that means laying out my workout clothes and planning which workout I will be doing. Picking out my outfit only takes a few minutes, but I would rather do it the night before to save time. Also – I find when I wear a cute workout outfit, it motivated me to push a bit harder. Does that happen to you too? LOL. I will also spend 10-20 mins before bed tidying up, emptying the dishwasher, picking out the kids’ clothes and making at least part of their lunches. It feels good knowing these things are done and it means I have more time for ME first thing in the morning. Do you wake up early? Do you have any tips to add on how you make it happen? Categories: Discipline, Exercise, gym, Sleep | Tags: 5am, Discipline, Exercise, motivation, sleep | Permalink. 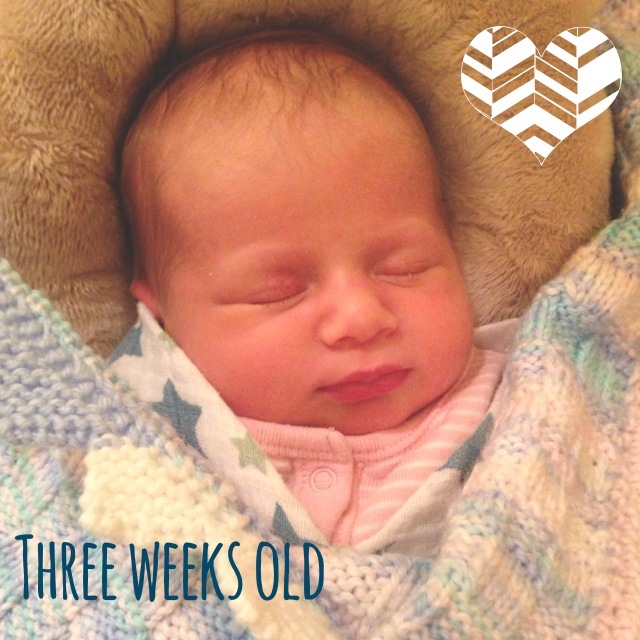 Today Alexandra is three weeks old! Hard to believe just three short weeks ago I was pregnant and wondering when my sweet little baby would be joining us. Things are going well, all things considered. I’m not going to lie – it has been exhausting with the boys home from school over winter break, and that is even with a lot of help from Jake and my parents. The popular new mom saying “sleep when the baby sleeps” makes a lot of sense in theory, but in practice is quite hard to implement with a third child. The boys are go go go all day long, and I’d love to catch a quick nap during the day, but it just isn’t happening even though Alex sleeps quite well during the day. Nighttime is a different story. 3-5 am seems to be party time and at all hours of the day and night she is a noisy sleeper and her strange grunts, squeaks and snorts keep this mama awake. With a third child, I have some perspective in that I know that she will sleep more at night EVENTUALLY and one day I will miss her newborn sounds. Adjusting to life with three kids is taking some time. I’ve just now figured out how to manage during the day on my own with all three of them. It involves a lot of organization, even more patience and a bit of humour. Today was probably our best day so far. I managed to make, serve and clean up breakfast, lunch and dinner for all of us, keep the house in decent order, do a few loads of laundry and everyone was relatively happy. This happened without the boys watching TV all day (just one movie), so I feel good about that. I remember when Dylan was born I was afraid to be alone with him for the first few weeks. If Jake had to go out, I would make my mom come over. It seems so funny now, because when Jake takes the boys out and I am alone with Alex, it feels like a vacation! In terms of post partum exercise, I am quite anxious to get started again. I’ve gone for a few walks, done a Nike Training Club workout, and done a few planks and push ups here and there. I really miss spinning and running but will be waiting a bit to get back into both of those. I know it is important that I rest now and let my body heal from birth. Waiting a few more weeks won’t make a difference in the long run, but starting too early could lead to injury, and I want to avoid that. It is humbling that just over a year ago I could run a half marathon (that’s 21km!!) no problem, and now I’m not sure I could even run 1km continuously. I know that my body has been through a lot and giving birth is a huge physical accomplishment in itself, but I really miss my hard workouts! Categories: Uncategorized | Tags: Babies, Exercise, sleep | Permalink.